Anyway, The Intouchables is not like that. It is funny and sweet and emotional but does NOT wallow in sentimentality or huge Oscar-winning screaming/sobbing/whatevering scenes. It feels real. It's based on a true story, on real people. 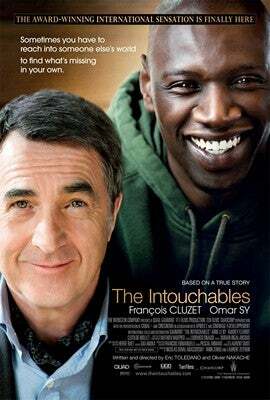 And it is beautifully filmed, the story is well-crafted, and the actors (Omar Sy and Francois Cluzet) are fantastic. Don't be put off by the fact that it's subtitled (for English-speaking viewers). It's not off-putting at all. Seriously, give this one a watch. I'm going to be buying both the DVD and the soundtrack.